What Is a NAS (Network Attached Storage) Device? What is a NAS (Network Attached Storage Device)? Is a NAS the Best Solution for Storing Your Media Files? NAS stands for Network Attached Storage. NAS devices are also sometimes referred to as Personal, or Local, Cloud Storage devices. As its generic name implies, if a NAS unit is incorporated into your home network you can save files to it, just like you can on a typical hard drive, but a NAS device serves a larger role. Typically, a NAS device will have at least a 1 or 2 TB (or even larger) hard drive to store files. The popularity of NAS units has increased as the need to store and access large digital media file libraries has grown. We want to stream media over our home networks to network media players/Media Streamers, Smart TVs, network Blu-ray Disc players, and to other computers in our home. The NAS acts as a "media server", making it easy for your network connected computers and compatible playback devices to access your media files. Since it is a “server,” it is easier for compatible playback devices to access files directly. Many NAS units are also accessible via a web browser when you are away from home; you can view photos and movies and listen to the music saved on the NAS by going to a personal web page. Many NAS units require loading software onto your computer. The software may be needed for your computer to connect to the NAS, and often makes it easier to upload files from your computer to the NAS. Most software includes a feature that automatically backs up your computer or specific files to the NAS device. You don’t have to leave your computer turned on for compatible playback devices to access your movies, photos or music. You can add to your media library without using up all the memory on your computer’s hard drive—1 TB drive can store up to 120 movies, 250,000 songs or 200,000 photos or any combination of files. Save photos, video, and still image files from all the computers to one central storage place. Access the files from everyone in your household that saves to the NAS (if they give you permission) even if they have left home with their laptop. Many NAS devices allow remote access to media files. When away from home you can play your stored media on any device that has an internet browser—laptop, tablet or smartphone. A NAS device that is a DLNA certified “media server” connects easily to other DLNA certified playback devices. Back up your computer to the NAS, or back up your important files in case your computer fails—manually or automatically. NAS devices cost more than an external hard drive with the same amount of storage. Older NAS devices may have problems connecting to computers and may not be DLNA certified. They may not be visible to some Network media players/streamers, SmartTV's, or Networked Blu-ray Disc players. Taking all into consideration, the benefits of a NAS device outweighs its disadvantages. If it's in your budget, a NAS device is a good solution for storing your media libraries. Ease-of-Use: Perhaps you think that home networks and computers are too hard to figure out so you shy away from products like a NAS. While a few NAS programs may still make you stumble through directories to search for drives and files, most include software that simplifies uploading and saving your files to the NAS. The software should also make it easier to access your files, organize them into folders, and share them with other users, with friends and family, and publish them to online websites. When doing research, notice if the product description or review mentions easy setup and use. Don’t forget that each person in the house may need to use the NAS. If you are an advanced user, be sure it’s easy for everyone in the home to upload, access, and backup files. Remote Access to Files: It’s great to access your centralized library from anywhere in your home, but it’s even better to be able to see your full library of photos, watch your movies, and listen to all of your music when you are on the road. Some manufacturers offer the option of accessing your files from computers, smartphones and other portable devices using a web browser. Remote access may be free, or you may have to pay an annual subscription for the premium service. Typically they offer a 30-day trial membership then charge varying fees for a year of the premium services. If you'd like to access your files away from home, or share your photos, music, and movies with friends/family or publish your photos to online services, upgrade to the premium service. Sharing Files: If you want to buy a NAS it is probably your intention to share your media library and files. With the other people (users) in your home. To view on your network media players, networked TVs, and components, or on other computers in your home. With family or friends who don’t live with you. Via online photo sharing websites. Some NAS devices can be upgraded, allowing you to upload photos straight to Flickr, Facebook, and similar sites, or create RSS feeds. RSS feed subscribers are notified when new photos or files are added to the shared folder. Some digital picture frames can display RSS feeds where it will automatically display new pictures as they are added. Is The NAS DLNA Certified? Most, but not all, NAS devices are DLNA certified as media servers. DLNA products automatically detect each other. A DLNA certified media player lists DLNA media servers and lets you access files without requiring any special setup. Look for the DLNA logo on the box or listed in the product features. Easy Computer Backups: It is recommended that you backup your important files to an external device so you don’t lose the files should your computer fail. A NAS device can be used to automatically (or manually) backup any or all of the computers in your home network. Many NAS devices are compatible with most backup programs. If you don’t have a backup program, research the backup software that comes with the NAS device you are considering. A good backup program should offer automatic backups. It may even backup a "mirror" of your entire computer. Some manufacturers limit the number of computers you can backup and charge a premium for unlimited backups. Storage Capacity: One terabyte of storage may sound like a lot—one terabyte is 1,000 gigabytes—but growing collections of high definition movies and 16-megapixel digital photos mean bigger and bigger files that require bigger hard drives. One Terabyte of storage will hold approximately 120 HD movies or 250,000 songs, or 200,000 photos or a combination of the three. Backing up your computers to the NAS will require more and more memory over time. Before you buy a NAS, consider your current memory needs by checking the size of your media libraries, and then note that your libraries will probably grow. Consider a NAS with 2 TB or 3 TB of storage, with additional expansion capability. Ability to Add Storage Capacity: Over time, memory needs will increase along with the need for more storage. 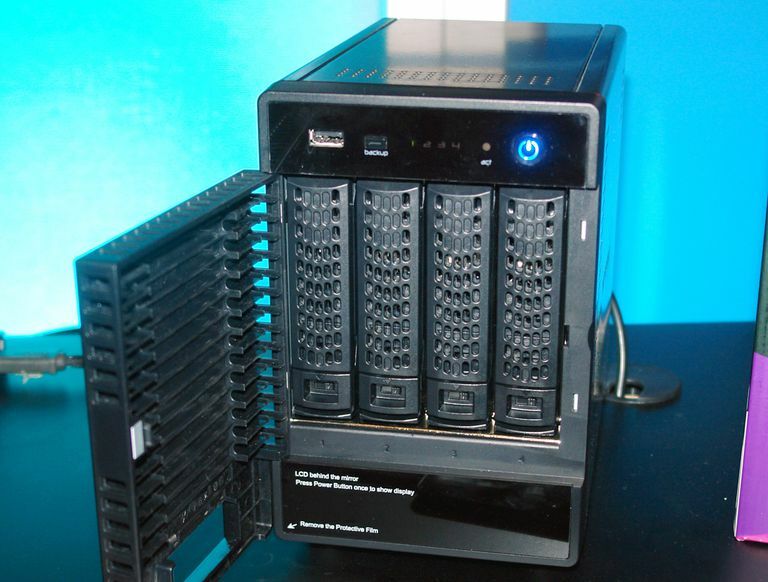 NAS devices that use an internal SATA-enabled hard drive, will often have an empty bay for an additional hard drive. Choose this kind of NAS device if you are comfortable adding an internal drive. Otherwise, you can extend the memory of your NAS device by connecting an external hard drive to the USB connection on a NAS. Reliability: A NAS must be reliable. If a NAS has connectivity issues, your files may not be available when you want them. A NAS should not fail or you could lose your precious files. If you read about any NAS device that is unreliable or has failed, you should look for another model. File Transfer Speed: Some NAS devices can transfer files faster than others. Uploading a 7 GB high-definition movie or your whole music library can take hours if you have a slow device. Look for a NAS that is described as a fast drive so that it doesn't take hours to upload your files. If you read reports of a NAS having problems streaming a high definition movie to another device, steer clear. Unique Added Features: Many NAS devices have a USB connection to which you can connect a USB printer or scanner, or combo. Connecting a printer to a NAS turns it into a network printer that can be shared by all of the computers on your network. If you need to find a way to store and easily access photos, music, and video files throughout your home or remotely, a NAS might be the right solution for you—check out our periodically updated suggestions.